Senior NATO officials said that at least 10,000 shoulder-fired anti-aircraft missiles are unaccounted for in Libya, and that at least some of them may have fallen in the hands of al Qaeda operatives. Der Spiegelreports that Admiral Giampaolo di Paola, the chairman of NATO military chiefs, have secretly briefed German Bundestag members on the topic (also see this earlier Spiegel report from 26 August). The admiral warned that the missiles may find their way to the wrong hands anywhere “sowohl in Kenia als auch in Kunduz,” (“from Kenya to Kunduz [Afghanistan]). The admiral said the missiles pose a real threat to civilian aviation. 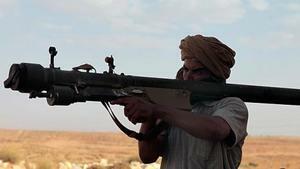 AFP reports that members of Libya’s National Transitional Council (NTC) have expressed similar fears. Although they put the number of unaccounted missiles at 5,000. The news service quotes General Mohammed Adia, in charge of armaments at the defense ministry, who told reporters that “about 5000” SAM-7 anti-aircraft rockets were missing. The general said that of the 20,000 SAM-7s bought by Gaddafi, “more than 14,000 … were used, destroyed or are now out of commission…. About 5000 of the SAM-7s are still missing … Unfortunately, some of these missiles could have fallen into the wrong hands … abroad,” the general said. Sky News reports that according to a U.S. State Department, more than forty civilian aircraft have been hit by such portable surface-to-air missiles since 1975, causing about twenty-eight crashes and more than 800 deaths around the world. The last known attack took place in November 2002, when two SAM-7 missiles were fired by al Qaeda operatives against an Israeli civilian plane in Mombasa, Kenya. The missiles barely missed their target. The missiles are known as SAM-7 by NATO designation and 9K32 Strela-2 in Russia. The systems were first developed by the Soviet Union in the 1970s, and typically have a range of about four kilometers and an infra-red guidance system. The systems are powered by a thermal battery, operated by a single person, and are simple enough so that a couple of hours of training would suffice for mastering their operation.